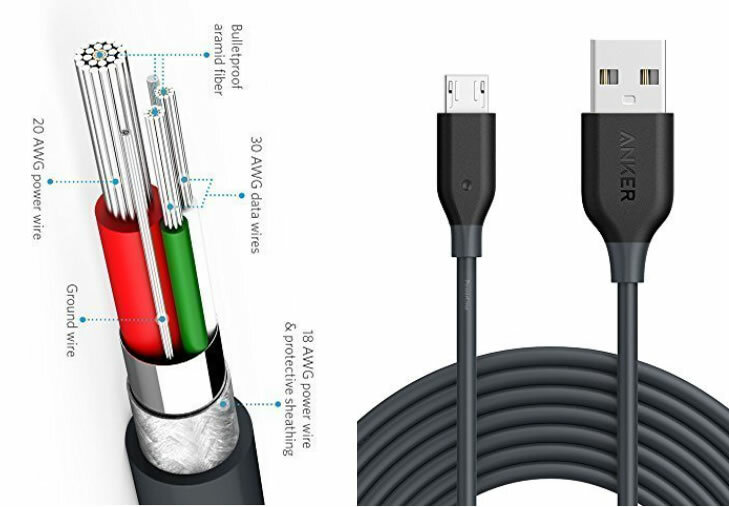 The most durable Micro USB cables are used for daily fast charging and data transfer / synchronization. Nearly every electronic device except for Apple products (you’ll need to buy a Lightning to USB Cable for iPhone/iPad) uses the USB to Micro USB cable. So if you have an Android, Samsung, Nexus, LG, Motorola, Nokia, HTC, Kindle or a generic device then you should always have a supply of Micro USB cables around. Personally, I have a couple in my office, a couple around the house, one in each travel bag and at least a half dozen more that I don’t know where. Which is why I’m always getting more of these cables – both the high quality ones that stay plugged in to the USB charges at home / office, and less expensive ones just for carrying around (and losing). For best construction, the “Anker PowerLine” series from Anker is our top recommendation. These are made with thick, stranded wire and a double-molded rubber compound at the ends. The thicker wire means you can get more electrons flowing faster through the cable which translates to higher data transfer speeds and faster charging, when compared with some of the lower quality cables. Anker also has what they call “bulletproof aramid fiber” for their cable construction. Basically, it means the cables will handle a lot more stress and last longer. The connector ends are reinforced and tested to last for a minimum 5,000 bend lifespan. This is years of daily usage, with plugging in and removing the cable. For many devices, the USB connector on the electronics will likely break before the cable does. In the event the cable does fail, Anker has an 18-month warranty for a free replacement. These are available in a variety of colors, including Blue, Red, White, Gray, and Black. And in the standard lengths of 1ft, 3ft, 6ft and 10ft. Below are the recent prices and links to buy through Amazon. Keep in mind that since these are high volume consumer items, prices may vary both up or down. Spearl 3Pcs Micro USB Cable (3ft, 6ft, 10ft) ($3.99 – as part of the Amazon Add On program). Covery 6 Pack Micro USB Cable (3x1ft, 3x4ft) ($7.99 – as part of the Amazon Add On program). Covery 6 Pack Micro USB Cable (2x1ft, 3x4ft, 1x6ft) ($9.99 – as part of the Amazon Add On program).